If New Zealand has developed a new ‘cult’ wine to rival Cloudy Bay in its 1990s heyday, it is ironic – and perhaps very fitting – that a top contender would be Greywacke’s Wild Sauvingon Blanc. 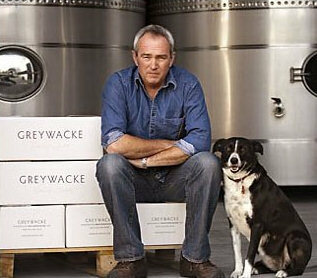 For the man who launched Greywacke in 2009 is Kevin Judd, for 25 years the man who also made Cloudy Bay. Named after a type of river stone found in the Marlborough region, Greywacke was an instant success. Tasting it in 2011 I rated that first release of the Wild Sauvignon 93/100 (still the joint highest score I’ve ever given to a Marlborough Sauvignon Blanc), but every wine in that initial release – the regular Sauvignon Blanc, Pinot Gris, Pinot Noir and Late Harvest Gewurztraminer – scored in the 90s with me. Critics loved the wines and as word spread, so did wine drinkers. A new legend was born. I’ve managed to meet up with Kevin a couple of times and to keep up with the wines, tasting the new releases each year, so it was a pleasure when he arranged for me to have this mini-vertical of all vintages of the Wild Sauvignon, 2009 – 2013, to taste the first five years of wine history in the making. The 2014 is now on UK shelves. As the name suggests, the ‘wild’ Sauvignon is made with naturally occurring yeasts (a big departure from the Marlborough norm, where specific cultured yeasts are used to enhance aroma, flavour and texture), and it is made in old oak barrels in a style more akin to Burgundy. Kevin does not own vineyards, so sources fruit from the cool Southern Valleys and the central Wairau Plains. With all of the Greywacke wines there’s a terrific balance between ‘hand’s off’, natural winemaking and pin-point, light touch accuracy. New expressions of Sauvignon Blanc are becoming more and more important for Marlborough, and Greywacke is undoubtedly a trailblazer in that respect. It is still leading the pack. Greywacke is imported by Liberty Wines. (2016) I just loved the creamy togetherness of this six-year-old Wild Sauvignon, where the sweet, ripe flesh of nectarine fruit, pushing into tropical, lightly smoky mango and papaya, is still infused with both the almond creaminess of the barrels, and the superb lime-streaked acidity that characterises these wines. Everything is wrapped in a delicious sheen of fragrant and delicate oak and downy fruit softness. (2016) This is a powerful Wild Sauvignon, with both a beefy 14% alcohol and a thwack of oak that seems to slightly dominate both nose and palate. There is a huge core of herbaceous character, and a mineral intensity, making this a formidable and profound example that has such concentration and such deeply-etched aromas and flavours that it is just a little less approachable as a drink right now than some, but which is hugely impressive. It's a wine that will integrate and improve further. (2016) There's a gorgeous sense of ripeness and quite opulent, succulent fleshiness where peach and fragrant nectarine skins melt into a touch of almond and sweet earth. In the mouth its a Wild Sauvignon with so much texture, the creaminess and the little disruptive graininess of tannin and grapefruit acidity, against that flood of creamy and rich, fleshy stone-fruit density. With its 14% alcohol a substantial expression of this wine that will show at its very best with food. (2016) The pea-shoot pungency of the Sauvignon comes through here in a wine from a cool year where those herbaceous aromas thrive, though the palate has both gently tropical, nectarine like fruit and a terrifically decisive sweep of citrus acidity. The oak very much in the background, but a more orthodox expression of Marlborough Sauvignon in many ways. (2016) This is a Sauvignon Blanc that marches to a different beat. It has intriguing nutty and honeyed nuances as well as ripe ogen melon fruit and a little hint of Sauvignon herbaceousness. On the palate it is savoury and layered, complex flavours underpinned by a grapefruit juicy tang and length, in a powerful yet subtle interpretation of the style. Will age for five years easily. (2016) Kevin Judd rarely puts a foot wrong and so it is with this terrific Pinot which displays fabulous complexity, so much schist and smouldering embers, truffle and complex terroir character. So long, bright, but with unfolding depths. Should cellar for five years and more, but delicious now.